Dr. Weiner's patient showing improvement in sweating after only 1 treatment. Axillary hyperhidrosis is abnormal increased sweating in the underarm area, in excess of that required to regulate one's body temperature. It affects about 3% of Americans, which is over 10 million people. Treatment usually is controlled with prescription topical medications. Botox is highly effective for this condition but requires re-injection at least every 6-9 months. Many sufferers seek a longer lasting solution to their problem. Current therapies for long term improvements are: Thoracic surgery with sympathectomy, a liposuction procedure to the area to remove or injure the sweat glands, or Miradry - microwave heating/destruction of the sweat glands. 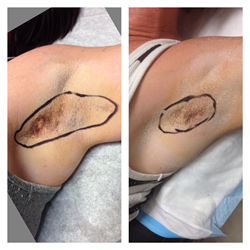 Dr. Weiner's Infini procedure starts with an application of the "Starch-Iodine" test to the axilla to define the areas of sweating. A topical numbing cream is then applied for approximately 20-30 minutes. The Infini is then applied to the area where sweating was noted. The Infini causes heating and coagulation at the ends of it's insulated needles using radiofrequency. When done at the correct level, the sweat glands will be destroyed in the area treated. Several passes are performed at different levels to ensure better outcomes. The procedure takes about 15 minutes total for both underarms and there is no downtime. Results become apparent within 5-7 days and are permanent because the glands don't have an ability to grow back. A second procedure is done in about 1 month to ensure that any remaining sweat glands are treated. No pain medication is required during or after treatment. During treatment, skin cooling is all that is needed in addition to the topical cream to be comfortable.